Coins are virtual goods within our games. In order to play most of the games you will need these Coins. The same Coins can be used in all the games, with the exception of Slots. Slots requires Slot Coins. 2. Why can't I convert Coins to real money? Coins can not be converted to real money because they don't represent a value. When upgrading to VIP or SuperVIP you will receive more Coins than what you pay for. By Dutch law it is forbidden at the moment to convert Coins into real money, as stated in the 'Laws on Gambling'. 3. How do I get these Coins? Every 3 hours you will receive free Coins. See for more information under "Gift" further down. Alternatively you can purchase these Coins as well. What is the GamePoint Wallet? The GamePoint Wallet is not a bank but an online wallet. All changes to your Coins are stored here. Players can earn Coins by winning games, by donations or by purchasing. Depending on your membership type (free, VIP, SuperVIP) you will receive extra Coins when purchasing. In addition to an overview of all played games and the associated score, you can also find an overview of your gifts. Coins in the GamePoint wallet cannot be withdrawn. GamePoint works with different currencies, including Slot Coins & Coins. Keep in mind that the gift timers for GamePoint Slots and all other games work independently. For example you can claim a free gift in GamePoint Slots as well as in Bingo without waiting 3 hours! The gift is paid 3 hourly to every unique IP and every VIP and SuperVIP. Multiple computers within one household are supported but with limitations. If there are both a VIP and a non-VIP name active from 1 location, only the VIP name will receive the Gift, irrespective of the fact if the non VIP name belongs to the same person or not. If you become VIP with that second non-VIP username, you will still receive the Coins (as soon as the payment for the subscription has been received by us). Non VIPs who have received a Welcome Gift less than a month ago on a username/ip address/e-mail address, will not receive these Coins again. VIPs get a 50% bonus on their gift. A SuperVIP gets a bonus of 100% on their gift. Gift are handed out according to CET (UTC +1/GMT +1) time. With this gift GamePoint wants to make it possible for every active player to continue playing coin games without an extra charge. As returning player your gift will increase per day, with up to 50%. By logging in consecutive days the gift increases every day and on the 6th day onwards you will have reached the maximum bonus of an extra 50% Coins. When receiving the gift a notification screen will appear in-game telling you how much you received and on what day you are. When you skip 1 day the bonus will be reset and you will have to start again with the original value. 1. What is a VIP membership? 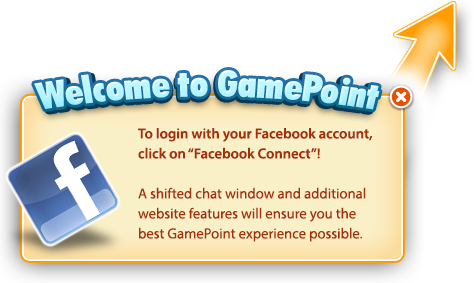 The GamePoint platform is a free to play service. This means we allow you to play all of our games for free as either a guestplayer or with one of our free memberships. However we have created many additional features that can only be used when you are a paying member like a VIP or a SuperVIP member. Not in the least, we would like to mention the daily coin bonus you will receive when you are a (S)VIP member and the bonus you will receive when buying Coins. 2. How do I become a VIP? VIP or SuperVIP are paid memberships. You can purchase one in the Memberships tab in the deposit screen and the VIP tab in your GamePoint wallet. Fill in all the necessary information and choose a payment method. 3. What does the early bird discount entail? If you extend your VIP or SuperVIP membership with another 12 months, before it expires, you get an early bird discount. The discount depends on how soon you extend your (S)VIP membership with GamePoint. 4.What happens with my VIP when I want to upgrade to SuperVIP? When upgrading from VIP to SuperVIP the remaining months of your VIP membership will be divided by 3. The cost for the SuperVIP will remain the same. For example: You have 1 year of VIP ahead of you, and you would like to upgrade to a year of SuperVIP. Your current membership is converted into 4 months of SuperVIP. So 4 months added to 12 months SuperVIP makes a total of 16 months SuperVIP. 5. Do I get (Slot) Coins when I buy a membership? You don’t get (Slot) Coins when you buy a VIP or SuperVIP membership. However you do receive 50% (VIP) or 100% (SuperVIP) extra (Slot) Coins on your daily gift or deposits. VIP and SVIP always receive 3 hourly Coins when coming online for the first time that day even when playing with multiple accounts. 6. Do I get a refund when I don't use the full lenght of my membership? You cannot cancel your paid VIP or SuperVIP membership after you have used it for some time. How long this is depends on your countries regulations. On average GamePoint memberships can be refunded within one week of the purchase date (with the administration cost of $4,-). After one week the membership cannot be refunded.